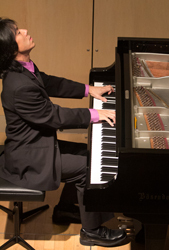 The critically acclaimed pianist TAKA KIGAWA has earned outstanding international recognition as a concerto soloist, recitalist and chamber music artist, performing extensively in New York City, Boston, Cleveland, Washington, DC, Barcelona, Milan, Paris and Buenos Aires, as well as throughout his native Japan, including the cities of Tokyo, Kyoto, Nagano and Osaka. He has also been a featured artist on television and radio networks in the United States, Europe and Asia. Taka Kigawa was awarded First Prize from the prestigious 1990 Japan Music Foundation Piano Competition in Tokyo and the Diploma Prize from Spain’s 1998 Concurs Internacional de Música Maria Canals Barcelona. His 2010 New York City recital was chosen by The New York Times as one of the best concerts of the year, while a subsequent 2011 recital was selected as one of the most notable concerts of the 2011-2012 season by Musical America. His 2014 recital in Buenos Aires was named one of the best concerts of the year by Argentina’s leading newspaper, La Nación. Possessing an extremely large and varied repertoire, ranging from the Baroque to the avant-garde, Taka Kigawa has collaborated closely with Pierre Boulez, Myung-Whun Chung and Jonathan Nott. He premiered the last solo piano work of jazz legend Yuself Lateef in New York City in 2013. Taka Kigawa grew up in Nagano, Japan, where he began piano studies at the age of three, and won his first competition at the age of seven. He earned his Bachelor of Arts degree from Shinsyu University and his Master of Arts degree from Tokyo Gakugei (Liberal Arts) University, graduating with honors in Piano Performance. During both his undergraduate and graduate years, Mr. Kigawa also studied composition and conducting, receiving high honors in both disciplines. He furthered his studies in the United States at The Juilliard School in New York City, where he was awarded a Master of Music degree. Taka Kigawa currently resides in New York City. Pierre Boulez’s Third Piano Sonata is a work of immense visual appeal and curiosity. One movement has staves printed in red and green, straddling huge sheets of cream paper in permutable networks. The other is ring-bound, so that its four sections can be played in different orders. Taka Kigawa played the whole thing from memory, eliciting astonishment. Mr Kigawa’s feat deserves the highest praise, especially since it was combined with such alacrity and sensitivity to the musical material. Mr. Kigawa was also expert in achieving the pedal resonances, in producing variety of color and in creating sudden shafts of expressive power. I have heard Mr. Taka Kigawa play my piano works and I was very much impressed by the brilliant way he performed them. He was precise, and at the same time inventive. I can highly recommend Mr. Kigawa to any organization and wish him all the very best for his career. Kigawa’s playing was impressive - it had to be - but as extraordinary as it was to watch his fingers dance across the rapid, complex passages, the delicacy of his playing was even more striking. In quiet moments, he summoned the merest ghosts of notes, tiny pinpricks just a half-step above silence. The Japanese pianist offered a program of Debussy, Liszt and Chopin, with a terrific mix of the elegant and the sublime. While some pianists value this sonata [Liszt] for its showy virtuosic potential, Mr. Kigawa brought real expressive depth to this massive work. With encores by Chopin and Debussy, Mr. Kigawa received a standing ovation and demands from the audience for a return engagement. The extraordinary Japanese pianist, who last year dazzled with Elliott Carter’s complete piano works, did not follow a chronological order, but opted instead for the opposite perspective - from most recent to earliest. Kigawa, whose rhythmic sensibility is truly astonishing, proved to be a real master in revealing recurrences, highlighting the reflections and exposing the hidden subtleties. The works on Mr. Kigawa’s syllabus – the two books of Debussy’s Images, Tristan Murail’s Territoires de l’Oubli and Marco Stroppa’s Traiettoria...Deviata – were far more similar than they were different. In Mr. Kigawa’s hands, they were investigations of the lives and deaths of sounds. As he moved through the program, you became increasingly sensitive to just how much of what you hear from a piano is a mysterious interplay of tones, sometimes long after the keys have been struck. Mr. Kigawa plays with a fundamental gentleness, even in intense passages, but he brings a precision to the relentless pricks and bristling repetitions in these pieces. Kigawa blazed through the 18 pieces in less than 90 minutes, taking only a short pause between each book, possibly to give the audience a breather more so than himself. The leanness of the presentation, the quality of the music, and the laser-like focus of the program combined for an awe-inspiring performance. Each part of Olivier Messiaen’s kaleidoscopic Catalogue d’Oiseaux (“Catalog of Birds”), which the pianist Taka Kigawa performed with preternatural ease over more than three hours, comes with a prose introduction. The text, while helpful for curious listeners, also provides clues for musicians to interpret 77 bird calls and evocations of nature. The paragraph that precedes “Le loriot” (“The oriole”) contains references to light and rainbows, and ends with the sun ‘spreading golden rays of the oriole’s song,’ rendered through rich chords that penetrate flittering transcriptions of bird song. In an interview before the performance, Mr. Kigawa said that his take on “Catalogue” is longer than others because he tries to take “a lot of space and silence.” These chords were one such instance: Already majestic, they became almost holy in his hands. I could not have asked for a better pianist, artist and collaborator! Taka was exceptionally warm and gracious with our musicians, and his interpretation of Ravel’s Piano Concerto in G was at times filled with fire and at other times pure poetry. Here is an artist who - while increasingly known for his interpretations of composers of the 20th and 21st centuries - is capable of playing EVERYTHING, and performing it with insight and a depth of understanding that is rare.